Each week, as regular readers know, we pose a series of questions to a winemaker. 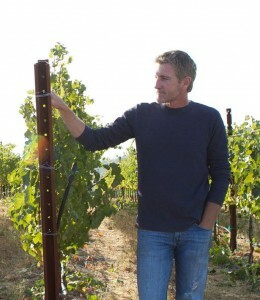 This week, we’re featuring Scott Hawley, one of Paso Robles’ top winemakers. In addition to several consulting positions, he’s the chief winemaker at Law Estate Wines and the owner of his own label, Torrin Vineyard. Law Estate’s first wines will be released this fall, and they’re already generating quite a bit of buzz — Jeb Dunnuck gave each of the first four releases stellar reviews. Hawley’s own label, Torrin, is a small vineyard landlocked between two of Paso Robles’ benchmarks, L’Aventure and Booker Vineyards. While production is miniscule, the wines receive rave reviews. Check out our interview with Scott below the fold. I know it said quite a bit, but it is true. It is all about working with special vineyards and letting them show through in the wine. I don’t spend time manipulating wines into any particular style, I’d much rather work with vineyards in places that are going to give me wines I enjoy. I also appreciate a wines ability to change favorably over time so rarely do I bottle wine that I would say is as good as it will ever be at that point. 2007 Bodegas Mas Alta Artigas. I’m sorry to say that I don’t have extensive knowledge of winemakers throughout history, but I have been fortunate to enjoy the company and wines of a couple of current winemakers that have certainly left a great impression. First to come to mind is Philippe Combie. He is a really kind and generous guy and if there is a winemaker’s hall of fame, his induction is a shoe in. While they are not exactly new winemakers, I have to recognize the guys right here in my own back yard. West Paso is in the process of redefining itself and has emerged as one of the most exciting wine areas in the world right now. While this is due to a number of things, it is the wines from people like Stephan Asseo, Justin Smith, Eric Jensen, Terry Hoage, Jordan Fiorantini, Cris Cherry, Matt Trevison, Anthony Yount, Nick Elliott, Brian Benson and Guillome Fabre, among other’s I’m sure I’m missing, that are fueling the fire. I live in the vineyard, I don’t get days off! Okay that’s not exactly true, I have a beautiful wife and two boys (6 and 8), so I spend as much time as I can with them. We hike, ride bikes, hang out at the beach, dissect owl pellets, that sort of thing. I do a fair bit of cycling when I can. I think the oldest is a magnum of 1995 Chateau Sourverain Winemaker’s Reserve Cab. I graduated from college in 1997 and finally had gainful employment and picked this up at a silent auction. Didn’t even know the wine, just stoked I had money to buy it! I don’t really know which is the most expensive, but with the well deserved love this wine has received, I’d bet it is the 2007 Saxum James Berry Vineyard. That’s crazy, but it’s summertime and we eat as much as we can from the garden and lots of fish and chicken, so I’d probably go with Pinot Noir and Sancerre. Like wine, life is generally more enjoyable when it is in balance. It can be quite a challenge at times remembering that it is just wine and not letting the process or the product consume more than its share of time and energy. I really like a lot of the wines coming out of different parts of Spain, but I’ve got to go to the Rhone. I know it is a bunch of regions, but when you’ve got Cote Rotie, Hermitage, Condrieu, Chateauneuf-du-Pape, Rousillon etc. you’ve got to give me some wiggle room. It is indeed. On tropical beaches, after long bike rides, with Thai food, and during harvest it may actually be the key to quelling potential mutiny. I’m color blind and I’m originally from Nebraska. Making wine is the only “real” job I’ve ever had so I don’t exactly have a fall back career. I met a guy recently that has a company giving guided mountain bike tours in Sedona. I might have to send that guy a resume! Success is being able to find more satisfaction in who you are than what you have accomplished.